Yesterday I reached the one-third mark of my cozy mystery by finishing chapter 9 of 27. I'm progressing more slowly than I'd like because I'm too tired to write after work, but I rarely manage to wake up in time to write before work. I'll keep doing what I can on weekends, and if I dedicate myself over the winter holidays I believe I'll finish the first draft before the new year. As part of my "research" for the novel, a few weekends ago I baked these beauties. This picture won't look like much to a disinterested third party, but to me it's irrefutable evidence of my triumph over the snickerdoodle. 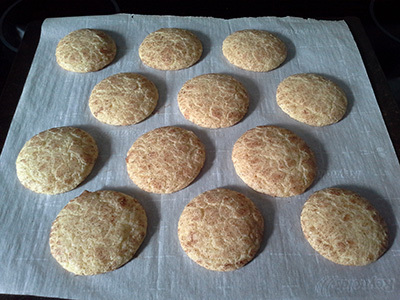 I've made several batches of snickerdoodles over the years, and all of them failed to impress. The batch before this one was a complete disaster. I used a traditional recipe that called for cream of tartar to activate the baking soda. The result was a cookie that looked and smelled lovely but tasted sour and left a horrible aftertaste. After forcing myself to eat the batch, so as not to waste the ingredients, my taste buds were traumatized. The mere scent of cinnamon made my mouth sting with the anticipation of bitterness. But I would not be deterred! The next week I bravely took up my cookie scoop and modified the recipe to use baking powder instead, and I successfully created these beautiful melt-in-your-mouth cookies. Snickerdoodle purists will say my version is merely a sugar cookie coated with cinnamon, and a snickerdoodle isn't a snickerdoodle without the cream of tarter tang. I say I'd rather have a fake that tastes delicious over a genuine article that makes my throat burn. My adventures with snickerdoodles exemplify what orientation facilitators at my college call a "growth mindset." The opposite of a growth mindset is a "fixed mindset." I'll define both in detail below. A fixed mindset is the belief that people are good at certain things and bad at certain things, and that can't change. People with fixed mindsets believe everyone is born with certain "talents," and succeeding is a matter of "finding what you're good at." One might also call it the Cutie Mark Mindset. In My Little Pony: Friendship Is Magic, young ponies have "blank flanks" until they come of age. When a pony discovers a talent that makes her special and unique, a cutie mark appears on her hindquarter, and she knows she's found her destiny. For example, Rarity has a cutie mark of gemstones because she's a talented fashion designer. 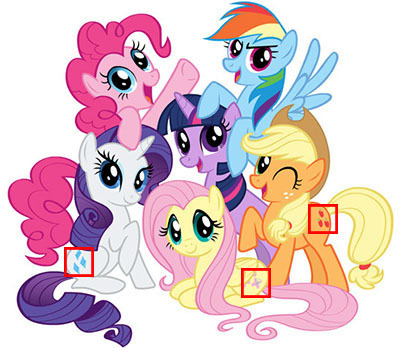 Fluttershy has a cutie mark of butterflies because she's good at working with animals. Applejack has a cutie mark of apples because she's destined to run the family farm. Etc. Many episodes follow the "Cutie Mark Crusaders," a trio of prepubescent ponies determined to get their cutie marks. Apple Bloom, Sweetie Belle, and Scootaloo try many things like cupcake-baking, costume-making, mountaineering, and sleuthing. Every time they try a new activity they look anxiously at their flanks, but nothing appears, and they droop in disappointment because that's not what they're destined to do. In the screenshots above, Apple Bloom tries her hoof at making cupcakes for the first time...and after burning them horribly, never tries again. If I'd given up like this after the first time I tried baking sweets, I would have lead a snickerdoodle-less life forever. Cutie marks are a fun concept for a cartoon, but that's not the way people work in real life. The first time we do anything, we make a mess of it. We develop skills over many years of patient practice. Having a natural aptitude for something gives a person an initial leg up, but after twenty years of dedication to cupcake-baking, or costume-making, or whatever, the difference between someone who picked it up quickly and someone who didn't will be negligible. Yet many an aspiring novelist acts like she expects to finish chapter one of her first manuscript and see a cutie mark of a Nobel Prize appear on her thigh. When that doesn't happen, she gets upset. She takes to Tumblr or Facebook or Twitter and declares that she apparently has no talent and she's giving up forever. A growth mindset is the belief that all skills and abilities can be developed through training. I call it the Kung Fu Mindset. The term kung fu, or g&omacr;ngfu in Pinyin, has been somewhat warped in English. The original word g&omacr;ngfu means any skill developed through diligent practice over time. Someone might have g&omacr;ngfu in dancing, or in noodle-making, or in any other skill that's difficult to master. The closest English word I can think of is "craft." The misinterpretation proliferated in the second half of the 20th century, when kung fu movies floated over to Western shores. Black-and-white Shaolin monks would talk about working on their g&omacr;ngfu, meaning their craft, and in that context their craft happened to be their fighting skills. So in the West we understood "kung fu" to mean an acrobatic style of martial arts full of high-flying kicks. But kung fu movies are still aptly named, because they emphasize the importance of hard work and discipline in developing skills. There are no cutie marks in kung fu movies. When the brave but rash protagonist loses his village to the gang of bandits, his white-bearded mentor doesn't say, "You're just not meant to be a hero." He instead says, "Patience, young grasshopper." To defeat the bad guys, the protagonist must learn that there are no shortcuts to mastery and that training, though boring and tiring, is the only way to improve. 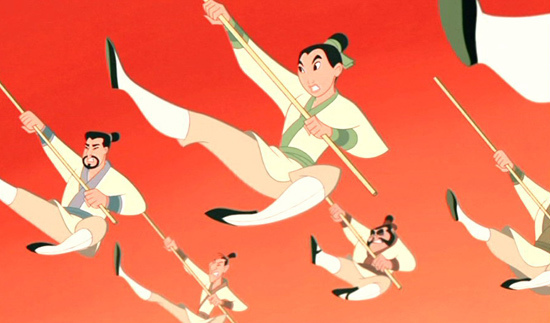 In the Disney movie Mulan, the heroine doesn't set out for her adventures as a skillful warrior...or a skillful anything, for that matter. She's a klutzy weakling, the laughingstock of the Chinese army. The general nearly sends her home in humiliation. But she keeps at it until she makes a "man" out of herself. If you think like an Apple Bloom, how can you change into a Mulan (magnolia blossom) instead? The switch is both incredibly easy and terribly difficult. It's easy because the mindset you have is all in your head, and you can make the choice to switch in an instant. It's difficult because you have to stick to that choice for the rest of your life, despite exhaustion and embarrassment and frustration. You'll yearn for those happy days when you could shrug and give up every time you hit an obstacle, and tell yourself it's okay because you're "just not cut out for this." One of the most masochistic things I ever did was to sign up for a drawing class at my previous workplace, Portland Community College. All my life I'd been the smartest kid in school, because school focused on subjects I was naturally good at, like math and science. Our industrialized society doesn't value areas I'm not naturally strong in, like art and athletics, so by high school I didn't have to face my weaknesses at all. Sitting in that drawing class at the age of 27, for the first time I was the slowest learner in the room. My 18-year-old classmates could toss off gorgeous pieces in minutes. I took two hours to draw a teapot. I had to remind myself (and sometimes, Sweetie had to remind me) that drawing skills come with practice over time. Every famous artist in history had to train for many years to become a "natural genius." Picasso's father was an art professor who instructed him in figure-drawing and oil-painting from a very young age. Jackson Pollack perfected his seemingly spontaneous method of painting over decades of experimentation. In writing, as in art and nearly everything else, whether you're gifted at the age of six, or sixteen, or even thirty-six, means very little. The most important quality in a writer isn't genius, but tenacity. Plenty of sixteen-year-old literary geniuses get impatient and come to nothing. Plenty of sixteen-year-old underachievers buckle down and accomplish great things. John Greene, author of The Fault in Our Stars, was one such sixteen-year-old underachiever. In the three-minute video below, he describes the kind of student he was in high school: a "screw-up" who skipped many classes "because they were early or because they conflicted with [his] schedule of smoking cigarettes in the woods." At 2:26, Greene says this. High school is not destiny. It's part of life, but I feel like when you're in high school, people act like it's the most important thing you'll ever do, and like the whole course of your life is being decided. But at least so far as I can tell, the course of your life isn't decided. Ever. Most of the time it's not like there's one fork in the road, and you choose one or you choose the other. There are hundreds of forks in the road every day that you're alive. College is also not destiny....Also, your twenties are not destiny. Your thirties are not destiny. Destiny is not something that happens all at once. It's something that happens only in retrospect. Since no magical cutie marks will tell us what are destinies are, we have to figure them out for ourselves. The only way to figure them out is to fail, and fail, and fail some more until we stop failing. What is the first letter of "Tennessee"?